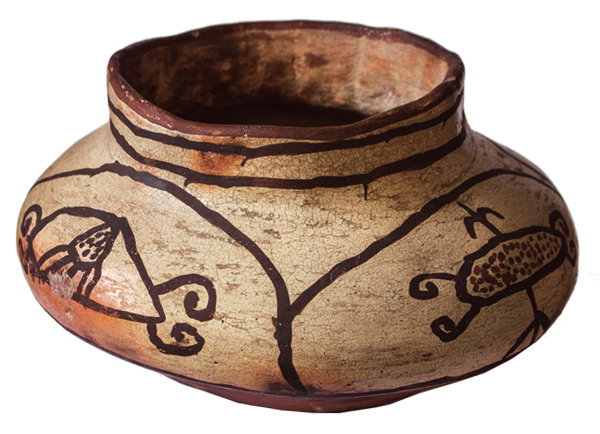 All at once, this lumpy, off-center jar manages to be charming, amusing and an important lesson in Pueblo and pottery history. During the mid-nineteenth century, times were hard at Hopi, and many Hopis moved to Zuni, whose religion they shared. While they were there, they learned to make pottery the Zuni way, with a Zuni white slip. It crackled and crazed, leaving all-over hairline cracks on the slipped surface. This crazing is characteristic of the Zuni-inspired style we now call Polacca Polychrome. Ironically, the style has nothing to do with Nampeyo's brother Tom Polacca or the town named after him at the foot of Hopi's First Mesa. 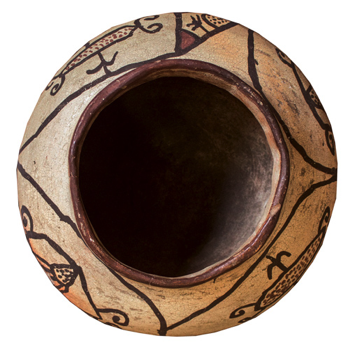 Earlier Polacca Polychrome pieces used Zuni designs, volutes and geometry that characterized Zuni pieces of the period. 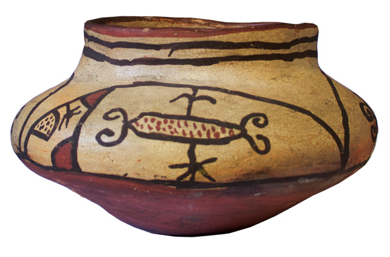 As the style progressed, Polacca Polychrome assumed a more Hopiesque personality. This piece, with its implausible insect creatures and the earlier-style red rim, falls in the middle period of style. 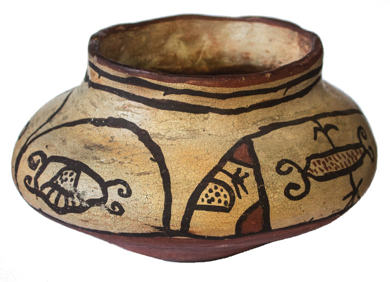 Later on, perhaps helped along by the trader Thomas Keam, Polacca pieces had more traditional Hopi designs that derived from Sikyatki Polychromes, pieces from a couple of hundred years earlier that influenced Nampeyo and have defined Hopi pottery from the 1900s to the present. This has its own provenance, as light-hearted as the piece itself. 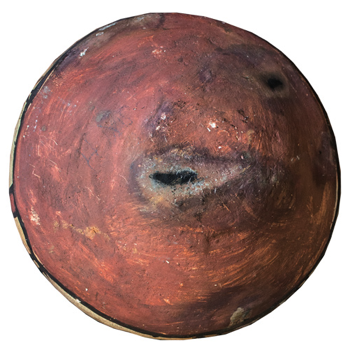 We bought it from a dealer who told us he'd bought it from another dealer, one of the leading pottery experts whom we turn to for advice and identifications. At the time we bought it, that expert happened to be across the room, so we asked him about the pot. Years before, he told us, his high school gym teacher had given it to his parents. Condition about what you'd expect for its age. No discernable repairs or restoration.